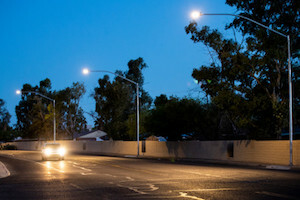 On Monday, April 15, between 6 a.m. and 3:30 p.m., Pima County Department of Transportation along with their contractor, KE&G, began installing overhead lighting for both pedestrian crosswalks on Esperanza Boulevard between Interstate 19 and La Cañada Drive. The work duration is approximately four weeks. Minor delays and lane reductions may occur during this work.